Has climate change been aggravating hurricane impacts? Could systemic climate risks trigger an economic emergency? Is it too late to make significant progress on climate change? To see how much information the Climate Web pulls together about how climate change will affect different regions and sectors, take a look at our Climate Impacts Deep Dive — and now you can purchase this Deep Dive for download to your desktop! 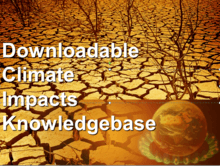 With the Climate Impacts Deep Dive, you can build a knowledge management system customized to your needs and save many hundreds of hours in populating your knowledge management system. Contact us for academic and NGO pricing.